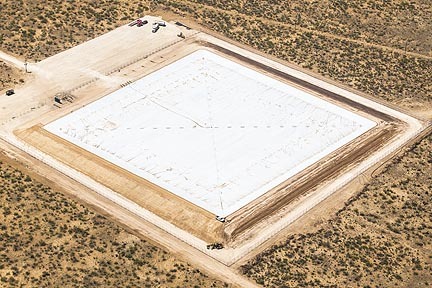 Evaporation/Algae Control floating covers are an economical way to prevent water losses in arid climates. Layfield's Evaporation/Algae Covers use a number of unique arrangements to fasten floats to a lightweight cover material. This produces an economical floating cover that is ideal for algae control, evaporation control and odor control. Evaporation/Algae covers are a variation of the defined sump style of floating cover. We found a particular arrangement of floats and weights that was much more economical than standard practice. Then we used our skills in prefabrication and installation to craft these elements into a unique cover system. The result is a lightweight cover that makes economic sense for evaporation or algae control. Layfield's Evaporation/Algae cover is ideal for irrigation and water treatment ponds. The use of prefabricated panels minimizes field seams resulting in reduced installation time and costs. Typically Layfield can float a 50,000 ft2 (5,000 m2) cover onto a full pond in a single day. Layfield provides a number of design services to engineers and facility owners. Enviro Liner® 6000x is Layfield's flagship flexible membrane liner geomembrane brand with exceptional UV resistance and performance properties. A floating tank cover can help to control odors, reduce evaporation, and prevent dilution of the tank contents. Layfield is a skilled installer of all geosynthetics products from geomembranes to floating covers to wick drains. Permeable floating covers help to reduce odors in manure containments. Short term floating covers can be used achieve the same functions as a regular floating cover but in a temporary use.